Have you heard of a blue star military family? What about a gold star military family? Have you wondered what this means and what is the significance of the colored stars? In general, a military service banner is a rectangular shaped banner given to families with members enrolled in the United States Military. 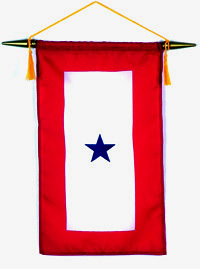 The military service banner features a white background with a thick red border and either a blue or gold star at the center. The number of stars can vary depending on the number of family members that serve or served in the military. The color of the stars can also vary. 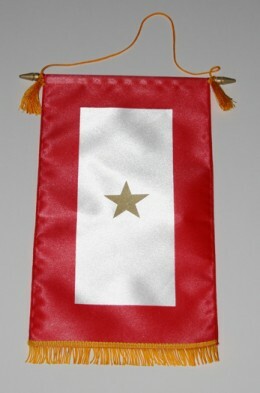 The Blue Star Service Banner was designed in 1917 and has served as a symbol for parents with children in the military. The use of the banner became popular during both World Wars. A blue star symbolizes that the child is currently alive and on active military duty. The Gold Star Service Banner is similar to the Blue Star Service Banner, but the meaning of the flag is entirely different. A gold star signifies that a family member has passed away while serving their country. Similar to the Blue Star Service Banner, the Gold Star Service Banner was widely used during the World Wars, but is still used to today. You did not address what a red star means. After an exhausting search, I found one reference to a red star service flag meaning that the service member is missing in action. Is this correct? Wow, I did not know that. That’s wonderful learning the meaning between the two banners. My thoughts and love go to everyone who served to protect our great nation!